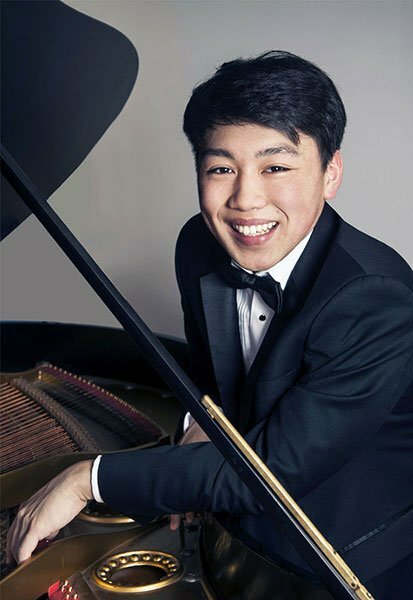 A former child prodigy, the young George Li has been a well-known pianist around Boston for over ten years, or half his life; his diminutive stature still suggests this earlier status. However, in recent years Li has won a number of competitions and awards, including the silver medal at the recent XVth Tchaikovsky competition; these collectively testify to an important career underway. Poised, confident, and apparently tireless (every repeat observed), Li gave a sumptuous performance of a demanding program Thursday at the Shalin Liu Performance Center in Rockport. The fervor of a 20-year-old sowing his oats combined with an impressively mature creative sense to cast quite a spell. In Josef Haydn’s Sonata in B Minor, Hob. XVI: 32, he employed the delicate touch of a harpsichordist with a pianist Romantic expression and nuance. In the first movement he could convincingly go from powerful pronouncement to pleading within a single phrase. Li’s handling of the Menuetto’s trio stormy minor-key drama constituted the most interesting music of the movement. In the Presto finale, Li’s sovereign control evoked the brilliance of Domenico Scarlatti, sweeping us along with rhythmic verve. In Frédéric Chopin’s Sonata No. 2 in B-flat Minor, Op. 35, Romantic virtuosity was the order of the day—as well as an amazing variety of touch and considerable, but not excessive, rubato. Initially, the first-movement contrasts seemed so big as to be slightly jarring, but this improved particularly on repeat. In the scherzo early on an uncompromising tempo and generous pedaling left the harmonies slightly muddied, but this too became better as the movement proceeded. As in the first movement, the chordal climax was hair-raising and the contemplative second theme lovely and cantabile. Li made the famous Funeral March somewhat less ponderous than the oft-heard “Soviet premier’s funeral procession,” giving prominence to the melody and lightening the left hand accompaniment. The second melody was warm and idyllic which served to make the reprise of the main theme more grief-stricken. The blurring of harmonies felt particularly appropriate in the “wind over the graves” Presto finale, yet ghostly forms did emerge from time to time before the great final B-flat minor pronouncement. Following intermission we encountered a rather infrequently heard work of Rachmaninoff. His Variations on a Theme by Corelli, Op. 42 presents the famous theme “La Folia” (which the composer mistakenly attributes to Arcangelo Corelli) along with 22 variations. This too showcased the artist’s practically boundless creativity. In addition to otherworldly ruminative sections, murmuring moments with peculiar harmonic progressions, and virtuosic, stentorian statements, there came nervous flurries as well as cascades of chords, quicksilver runs à la the concertos, and a recitative with cadenzas. Following a great deal of bravura, Li brought the piece to a mournful, quiet conclusion. Reluctant to remove his hands from the keys after the final chord, the pianist held the audience bewitched for nearly a minute. Liszt’s Hungarian Rhapsody No. 2 rounded off the program. The famous powerful opening chords led naturally into the more legato melody, infused with Gypsy volatility and Hungarian passion though each recurrence of the theme had a slightly different character. The arpeggiated treble episode skillfully built up excitement, and the chordal climax became something tremendous, the accentuated offbeat chords requiring wrists of titanium. The alternating major/minor section had a delightfully flirtatious character, and the stupendous ending elicited a well-deserved standing ovation. Li gave us two encores: Liszt’s transcription of Robert Schumann’s song Widmung and Vladimir Horowitz’s Variations on a Theme from Carmen. The warm and deeply felt transcription ended with a soulful treatment of the quote from Schubert’s Ave Maria. The variations took on the spectacular one would expect from a Horowitz vehicle and earned a second standing ovation. All signs point to a stellar career for this gifted artist. Great review,well-written and descriptive! I agree with everything………..a stunning recital!